How do you close out a pre-debut project like LOONA’s? How do you bring the many ideas and sounds contained within the previous 8 solos and 4 sub-unit singles to an outcome? But Yves, Chuu, Go Won, and Olivia Hye were given this herculean task, and came together as Youth Youth by Young, aka LOONA yyxy to be the conclusion of the sweeping story the LOONAverse had been introducing for over two years. The story of LOONA took a dramatic shift before yyxy. Odd Eye Circle injected a positive, forthright energy to the universe as a direct contrast to what came before them with LOONA 1/3 and yet, it still felt incomplete. Between the two of them they barely scratched the surface of complexity within the idea of girlhood. One could be passive or active, with little in between. To deal with this yyxy took a major lyrical shift and forgoed a more distinct musical identity for their era. In its place the videos took on the brunt of the storytelling while the lyrics focused on one thing. Each of the girls sang not about boys or a general idea of love but of self love. Differing perspectives of self-love combined to give us a more complete idea of what LOONA’s story was. Yves fell from Eden and crashed into our hearts when she began the final saga with the deeply satisfying “new.” It turns the bounding confidence of Odd Eye Circle into something quietly simple. The heavy 80s synths feel immediately powerful. Where OEC were manic and excited, Yves doesn’t waiver, preferring a steadiness of strength felt from within. Yves understands that the conclusion LOONA seek isn’t in being loved or loving someone but in how you come to make those decisions. It’s the in-between point of figuring yourself out and knowing what’s best for you. Yves grabbed the LOONAverse by the throat and told it to calm down. All of the yyxy girls’ songs were a response to this and none of them took it to heart quite like Chuu. “Heart Attack,” her solo song, is what happens when LOONA ⅓ are graced with the influence of Yves. Big brass wills Chuu down a difficult path of big vocals and emotions. Her heart is unstoppable, at a level of obsession not seen before in the LOONAverse. “Heart Attack’s” music however, does feel familiar at times so it is up to Chuu to elevate it. None of the other girls matched her on record for pure personality, “This must be what thrill feels like, darling” she bellows in the chorus. Her voice shifting tone depending on just how happy she is. Her unabashed sentimentality is no surprise given Yves’ influence. It is, at the same time, naive. Yves’ message has been missed by Chuu. She changes her whole life to suit this person, “All of my standards are set to you / Like the moon spinning around the earth.” She’s shoved along by growing layered background vocals and stronger synths to a point of apparent euphoria. Chuu gives everything to her vocal tone, a parallel to how she’ll give everything to the other she sings of. “I’ll give you all my heart /Take my heart,” she pleads. Her feelings are in whiplash. Taking confidence from Yves, Chuu goes too far in changing her “quiet heart.” It’s the response of someone who was waiting for confidence for too long and couldn’t handle it. Chuu never really had a quiet heart, just never had the support to know this. Someone who really does have a quiet heart is Go Won. 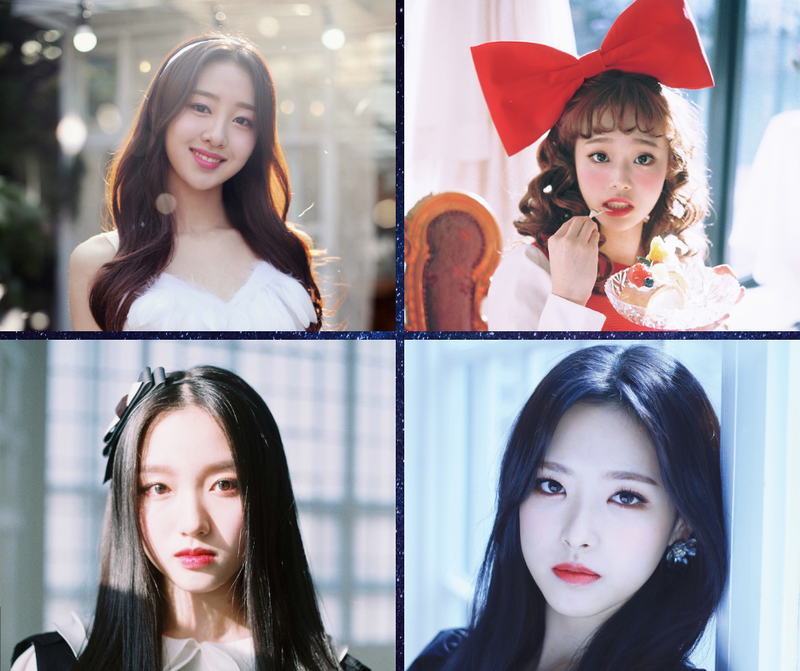 On first meeting, the third yyxy girl is slight and mysterious. Her voice is simple, barely going above a talk-sing type for the majority of her solo song “One & Only.” The straightforward synth of the track does well to back her up. It does not undermine her at any stage. It has bright piano chords to prop her up in the chorus and shimmering synths to match her as she highers her pitch rising to the chorus. Her voice is warm and unique but also innately familiar as if everything she sings we all know deep down. Right from the beginning, Go Won understands the importance of self-love. “When that shadow takes a step towards me / Even the darkness feels bright,” she sees light in everything because she pours light onto everything. She doesn’t need no garden of Eden. Olivia Hye, yyxy’s final girl, is someone who sees almost no light. She took Yves’ message as a betrayal. Her song “Egoist” is not a celebration of self-love but a lament for the heartache of how she reached it. Olivia still held onto the idea that true fulfilment came only through love of another. She was not prepared to lose them or to hear that her ideals had been wrong this entire time. “I wanted to despise you /But my heart wouldn’t let you go,” she ekes out at the beginning. Her voice, a strained apathy, fits these words perfectly. The track’s opening piano chord starts a fraction of the way through like we have barged in on her revelation. The piano drops when her sadness turns to anger, though. Her rage slowly distorts the song into a whirling industrial clash of defiant synths and destructive percussion. The melodic whistle from the chorus is coerced into a desperate scream. The song’s expressiveness mocks the cold flatness of Olivia’s voice. To make matters worse Jinsoul follows this. Her self-referential rap is full of temptations about being in an “endless cycle” together. She is a voice that Olivia does not need right now, and it shows. As the song progresses it has nothing to else to offer. Olivia’s voice, still inert, doesn’t convince us of the words she’s singing. She still sings of fate, a fate she fears was taken from her prematurely. Her anger is still focused on the person leaving, rather than her own inadequacies. The conflict inherent in Olivia Hye and her song seemed to be a great jumping off point for LOONA yyxy to come together as a unit. Instead they did something strange: “love4eva” is a song made to situate LOONA within the larger world of K-pop. Almost every major detail links them to two other era-defining girl groups of their time, Girls’ Generation and I.O.I. Starting with producer E-Tribe, even the announcement of their involvement was treated as a big coup. E-Tribe are known for a number of iconic hits like Hyori’s “U-Go-Girl” and Super Junior’s “It’s You,” but none quite as legendary as Girls’ Generation’s “Gee.” Their involvement was a statement but how they used the feature from Canadian artist Grimes locked in the comparison. Much to everyone’s surprise, her only involvement was in the song’s intro. Her English language declaration of LOONA’s finally being together is a riff on not just Tiffany and Jessica’s intro for “Gee” but the many times K-pop has done this the years over. The lyrics as well are a such a generic take on first love that it could be parody. The wonderfully ridiculous line about kidneys comes close to convincing me of that. Even before Grimes’ part, it’s easy to spot the I.O.I connection as well. The precise, rolling synths immediately recall that group’s best track “Very Very Very.” “love4eva” strives for the breathless energy of that song but can’t quite go past imitation. Right at the end, yyxy go on to refer to the choreography of “Very Very Very” too, as in their ending pose they continue moving along with a heart gesture. It’s smaller than the other references but in ending the track it leaves the imprint of all of those other ideas in our mind. This all combines to position LOONA as a group following these two. It would be hard to argue that anyone other than Girls’ Generation is the the most definitive K-pop girl group, and I.O.I were the first group since them to change how the industry worked by making competition shows the new most lucrative debut plan. LOONA have decided that they are next, stating that their form of marketing is what future girl groups will be copying. This, unfortunately, is the final legacy of yyxy. They jumped the gun on the anticipation of their debut by dropping a genuinely interesting thematic exploration in favour of something more palatable for a larger audience. Regardless of quality, “love4eva” and LOONA’s debut single, “Hi High,” are a digression from what made LOONA interesting in the first place, their focus on the girls themselves. It was the distinction between the solo songs and the diversity of sounds and ideas that were used to build characters that made LOONA connect with so many. That yyxy could have four separate songs about self-love, all with different perspectives was frankly beautiful. They worked to define the impossibility of identity, and it sadly remained impossible to carry through to the finale. What do you think of the LOONA yyxy era? Let us know in the comment section below. Be sure to subscribe to the site and follow us on Facebook, Twitter, Instagram, and Tumblr to keep up with all of our posts. As the final bars of LOONA ⅓’s “Sonatine” slowly faded out, the digital effects opened a new door for LOONA. On the other side of it are Kim Lip, Jinsoul, and Choerry. As a trio they are ODD EYE CIRCLE, a name that necessitates capital letters thanks to the moon-evoking imagery of the word “odd.” These three represent the next chapter of the LOONA story. Writing the previous entry to this series on LOONA was a much easier task than this addition. With the added benefit of hindsight, I knew what had come after the first five girls of LOONA so could more easily chart their progression and what that meant in contrast to the three girls who would become ODD EYE CIRCLE. When the three of them did finally come together though, there was a whole new clarity to the ideas behind LOONA. Whereas the first five girls’ were moving towards a group identity as a whole, ODD EYE CIRCLE traces individuals. The musical timeline of this trio’s solo singles are sort of backwards. You could probably look at them in forwards or backwards chronological order but for me going from Choerry to Kim Lip makes the most narrative sense. Choerry’s solo single, “Love Cherry Motion” acts as a bridge between ODD EYE CIRCLE and the previous girls. She moves away from the physical sound to something a bit more modern but with such a classic pop sound that it isn’t immediately obvious. The bubbly synths are helped by drum samples and wonderful slap bass straight from Girls’ Generation’s “Party.” Of course, it becomes quickly obvious that LOONA are moving in a new direction when the post-chorus breaks hits. The first break comes with no notice and overflows with heavy bassy electro. It’s the darkest moment of LOONA’s entire discography without going too deep into seriousness. By itself the sudden genre change isn’t exactly a shock in K-pop anymore. As the song progresses, the break changes though. Middle Eastern sounding synths are added to the second chorus, galvanizing the second half of the song into a major change. From that break it turns into a bridge in a similar style, but not quite as heavy as before. The song slowly adds the brighter elements of the beginning before finally transitioning back into the original sound. As the bridge between both groups of girls, Choerry simultaneously shows both styles in contrast and in unison. Moving from an abrupt transition to a smooth one, she starts to bring the pop and EDM sounds together in search of a synthesis. Jinsoul preceded chronologically Choerry with her tumultuous future bass track “Singing in the Rain,” but her song propels ODD EYE CIRCLE’s mythos. Completely shedding any memory of the first five girls, she moves into an edgy digital space. The sawtooth synths and explosive percussion of her song have a dangerous unpredictability to them. Jinsoul is experimenting in the grey area between Choerry and Kim Lip. She’s the first to rap and does so with relish, adding ad libs to pre-choruses. That pre-chorus changes for the second chorus as well. “Singing in the Rain” is what happens when a group is trying to figure itself out. It’s not as experimental as “Love Cherry Motion” but it’s still not a completely polished product. Jinsoul is much more direct as well, “For the sin of swallowing, up the afternoon sun, I’m right here, so hot,” she coos in the chorus. It’s a forwardness unknown to the other girls. She’s a girl in love, not waiting for someone but taking the lead to the point where she sings loudly about it in the rain. The actual first girl of ODD EYE CIRCLE to debut was Kim Lip. It was quite a jump from the emotional orchestra of LOONA ⅓’s “Sonatine” to the sci-fi R&B of “Eclipse.” Compared to “Love Cherry Motion” and “Singing in the Rain,” “Eclipse” is stunningly simple. Kim Lip rides the beat with ease, her voice restrained but with a deceptive range. It has none of the eccentricities of Choerry and Jinsoul’s tracks, but feels at home beside them. As soon as she opened the song with “This is our fantasy,” it was obvious a new era had begun. Kim Lip represented a clean break for LOONA, one of sensuality and maturity. Despite progressing LOONA’s sound, the three girls didn’t have too much in common apart from a sense of modernity. So instead of coming up with a single style that compliments them all, ODD EYE CIRCLE mashed all three separate sounds together. Their debut single, “Girl Front” has the propulsive percussion and sawtooth synths of “Singing in the Rain,” the pop sheen and slap bass of “Love Cherry Motion,” and the vocal details and oh-so-smooth bridge of “Eclipse.” Thanks to its sheer peppiness and strong chorus, “Girl Front” doesn’t buckle under the pressure of those three tracks but instead the hyperkinetic vocals carry it to a euphoric climax. “Girl Front” is miraculous not just for putting these songs together but for incorporating them so wholly. It works to highlight the trio as individuals before bringing them all into one. Each girl sings a line from her solo track and has a part of her choreography at the beginning of the the collaborative song, making it clear that their identities are not totally defined by the group that is LOONA or even ODD EYE CIRCLE. This entire project is clearly not just an extremely long teaser for a 12 member girl group but promotion for soloists and all manner of units. As the centrepiece of ODD EYE CIRCLE, it is also the exact opposite to what the LOONA 1/3 did lyrically. It’s a song about the girl confessing first. ODD EYE CIRCLE are similar to the other girls in that the waiting is making them anxious but for completely different reasons. They are not concerned with big questions of what love might be for them, they just want to fall in love. Naturally LOONA are attracted to moon symbols, so finishing off the ODD EYE CIRCLE era with something cyclical made perfect sense. The final single “Sweet Crazy Love” is positioned by its video as the prequel to ODD EYE CIRCLE. The music as well puts it closer to the first five girls than anything else ODD EYE CIRCLE did by incorporating some string work. The strings open the song but are immediately obvious as not real but rather digital violins and are soon joined by an electric drum beat. Its moody R&B atmosphere is closest to “Eclipse” in sound but doesn’t have the definite stamps of each girl. There are short references in the lyrics but no direct lifts like in “Girl Front.” “Sweet Crazy Love” is caught right between the first two eras, melding ideas and sounds from both while obviously steering closer to ODD EYE CIRCLE. It brought this LOONA cycle to a definite close but left no hints for what is to come next. ODD EYE CIRCLE took LOONA into modernity with not just their sound but with their attitudes towards love. There are plenty of genres left for them to explore, but not as many broad themes for the last four girls to live in. Regardless of how they sound, the sense of finality is going to be a major idea. They are likely to cycle back around to the very beginning, creating an ultimate group in which the individuals are all connected but more than capable of standing on their own. Which means that the last four girls are the most important. Everything has been great and extremely well planned but it will be for nothing without an ending. Or, in this case, a whole new beginning. What’s do you think of the ODD EYE CIRCLE era? What do you think is next for LOONA? Let us know your thoughts in the comment section below. Be sure to subscribe to the site and follow us on Facebook, Twitter, Instagram, and Tumblr to keep up with all of our posts. The middle of September brought us a lot of good music, and like each week the KultScene crew rounded up some of the songs that really caught our eye. New music courtesy of the ladies of Loona, Teen Top’s NIEL & JUSTHIS, and a cover of an EXO song by soloist Gummy really caught our eye. Take a look at our thoughts and let us know in the comment section below what your favorite song of the past few days was. The LOONAverse continues in earnest with their second official sub-unit, Odd Eye Circle. 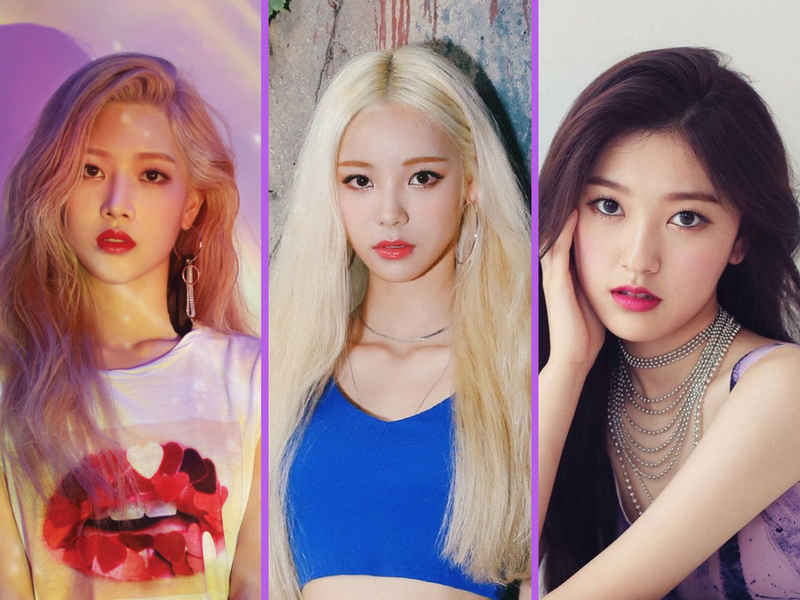 Consisting of the last three girls to debut, Kim Lip, Jinsoul, and Choerry, Odd Eye Circle is the girl crush side of LOONA. Produced by Ollipop and Hayley Aitken with some lyrics by Monotree, “Girl Front” is essentially a combination of those three girls’ solo tracks. Both musically and lyrically it takes from each of them, the propulsive percussion of “Singing in the Rain,” the brightness and slap bass from “Love Cherry Motion,” and the smooth as hell bridge from “Eclipse.” It’s a testament to LOONA and their team that they can create a concept as complex as this while still producing great tracks. “Girl Front” is the most energetic of all their songs to date; their vocals bounce off one another with ease, a variety of synths and drums samples seem buoyed along with the girls. It’s the fizziest most exciting kind of pop there is. There are few things I love more about K-pop than covers that completely recreate the original song. While EXO’s “Ko Ko Bop” was a feel good summer song, Gummy swooped in and made the hit her own during a recent episode of Park Jinyoung’s Party People drenching the track with her effusive blend of sultry vocals. Paired with the accompanying live band, the soloist offered up a more mature, jazzier take on the track, an alternative to the boy band’s reggae-tinged track. If this is the sort of thing that Party People will be offering up each week, I am very much here for it! Teen Top has always been one of those groups I casually like but never actually stanned. Most of their singles are bops, so when the members go solo, I most definitely keep an eye out for them. I wasn’t particularly impressed by Niel’s past solo, so I wasn’t expecting much this time around. And while “What’s Good?” is not particularly anything groundbreaking, it definitely shows a new side to the singer I’m here for. I especially liked that Niel’s channeling his inner Kikwang and going a more pop-R&B route, both musically and through the choreography. “What’s Good?” caught me by surprise because I had always seen Niel as a singer and not really a performer. But with this comeback, it’s clear that Niel means business and he’s gearing up to what may be Teen Top’s upcoming disbandment.